South Korea’s central bank on Friday held the key rate steady at 1.5 percent for a ninth consecutive month on sluggish employment and external unease in August, defending its “accommodative” stance in normalizing monetary policy. The Bank of Korea cited sluggish employment conditions and spreading global trade protectionism, while expressing optimism for consistent domestic economic growth, favorable movements in exports and a moderate level of consumer price inflation at around the mid-1 percent level. An unexpected rise in uncertainties that stem from both upside and downside risks has become a new factor to consider, BOK Gov. Lee Ju-yeol said in a press briefing. 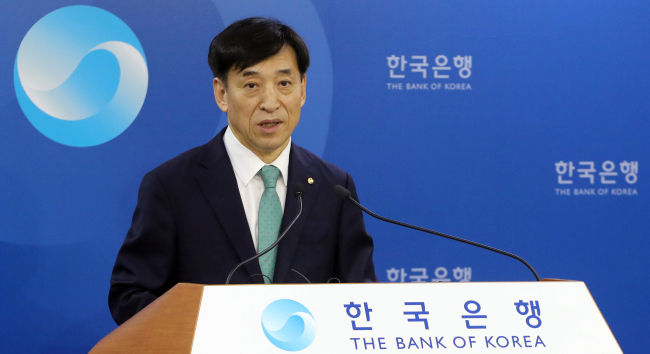 “Standing in the way of (Korea’s) economic growth are downside risks from global trade war threats and bearish financial market, in addition to the upside risks from the government’s expansionary fiscal policy,” Lee told reporters. 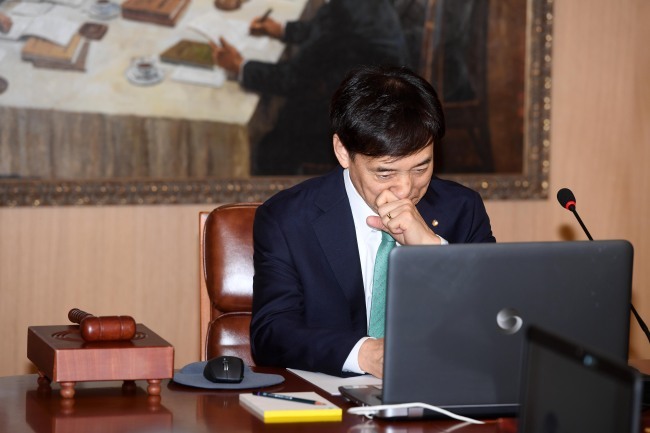 In July, Korea created some 5,000 jobs, the worst figure in eight years, leading to the government’s pledge to spend 23.5 trillion won ($21.1 billion) in 2019, up some 22 percent on-year, to fight fallouts from corporate restructuring and low domestic demand. This is part of the 2019 national budget that is expected to rise 9.7 percent on-year. Lee hinted at further revising down the annual jobs forecast in 2018, expecting the number to be below the central bank’s earlier revision to some 180,000 in July, from some 260,000. The decision by the central bank came despite hawkish signs in July, as out of the seven Monetary Policy Board members, one dissenter called for a rate hike. Also in Friday decision, the same dissenter Lee Il-houng again urged for a rate hike by 0.25 percentage point. Before July, the board had made a unanimous decision for a rate freeze. The dissent no longer serves as a hawkish sign, Kong Dong-rak, an analyst at Daishin Securities, told The Korea Herald. Bond markets responded to the news Friday morning. The three-year sovereign bond yield fell 34 basis points as of 11:30 a.m. Friday from Thursday’s close. The 20-year state bond yield dropped 19 basis points. Korea effectively put an end to an expansionary monetary policy in November 2017 by raising the rate by 0.25 percentage point, in tandem with US Fed rate hikes and signs of domestic economic recovery. After the first rate cut in 2 1/2 years in July 2012, the BOK implemented five more rate cuts to the record-low 1.25 percent since February 2016. The pace of BOK’s monetary tightening is slow compared to the US Fed. Since 2017, the US Fed carried out five rate hikes and is eyeing two more hikes by the end of this year. The US benchmark rate currently stands at the range of 1.75-2 percent. Lee said the widening gap in interest rates of Korea and the US, coupled with strengthening US dollar, is likely to “trigger foreign capital flight” from Korea, adding the degree of impact from it will be limited at a current level. If the US Federal Reserve conducts a rate hike as anticipated in September for its pursuit of monetary policy normalization, Korea’s benchmark rate will be 0.75 percentage point lower than that of the US at maximum.